OBJECTIVES: To describe our patients' demographics and clinical characteristics, our method of PD catheter placement within the Radiology Department at Kimberley Provincial Hospital, compare our early complication types and frequencies, overall peritonitis rate and one-year catheter survival rate with findings in the international literature and, by demonstrating comparable outcomes, propose that percutaneous placement be considered as a feasible alternative to conventional placement techniques. RESULTS: The study group comprised 16 male and 9 female patients with a median age of 44 years. Hypertension was the primary cause of end-stage renal disease (ESRD), and was found in 10 (40%) patients. Our early exit site infection rate of 12% was slightly higher than that found in the literature. Literature varies on the overall infection rates; however, our overall peritonitis rate of 0.75 episodes per patient-year was higher than that recommended by the International Society of Peritoneal Dialysis. This finding might be attributed to the lower socio-economic grouping of our patients and the small number in the study group. All but two peritonitis cases were successfully treated with antibiotics, and we had no major procedure-related complications. Our early peritonitis rate of 8%, as well as the other early complication types and rates, and our one-year catheter survival rate of 84%, compared favourably with international studies. CONCLUSION: Percutaneous PD catheter placement under conscious sedation with the aid of ultrasound and fluoroscopy is a sound alternative to conventional methods in the resource-limited developing world. Renal dialysis is therefore the mainstay of ESRD treatment, but is underutilised, mainly owing to financial constraints. Two well-established methods of dialysis are haemodialysis (HD) and peritoneal dialysis (PD). PD is a most effective renal replacement therapy that offers several advantages over HD. The advantages of PD make it a viable treatment option for ESRD in resource-limited developing countries where a chronic dialysis programme can be sustained. • the requirement for daily dialysis. In comparison, HD patients are usually dialysed three times per week. PD catheters (Tenckhoff catheters) are usually placed using open surgical, laparoscopic and percutaneous (Seldinger) techniques.3,4 Various international studies have been conducted comparing the techniques by assessing patient outcomes, costs and related complications of these different placement techniques. We place PD catheters via the percutaneous method with the assistance of ultrasound and fluoroscopy under conscious sedation within the Radiology Department at Kimberley Provincial Hospital. This report describes our method and is a retrospective analysis of patient outcomes. Approval was obtained from Kimberley Hospital's Clinical Manager and the Research and Ethics Committee of the University of the Free State. We retrospectively analysed the hospital records of 25 patients who had their PD catheters inserted between January 2009 and May 2013. These records are kept at the hospital's dialysis unit. We collected data using a pro forma, recording early (within the first 30 days) and late (>30 days up to 1 year) complications and their frequencies, patient demographics (age and gender), causes of renal failure, comorbidities and the referring physician's reasons for choosing this placement method. The type and frequency of predetermined catheter-related complications were documented within the two time intervals mentioned above. We also noted whether the catheter was removed, how long after the insertion date it was removed, and the reason for removal. Non-surviving patients were included. Patients were excluded if they defaulted their follow-up within the first year after placement or if their hospital records were incomplete or missing. • Comparing our early catheter-related complication types and frequencies to those in similar international studies. • Determining our one-year catheter survival rate (calculated as the percentage of normally functioning catheters after one-year from the insertion date, using the Kaplan Meier method) and comparing it with similarly calculated international studies. • Determining our overall peritonitis rate (calculated as number of infections, divided by time at risk and expressed as episodes per patient-year) and comparing it with international recommendations. Data were analysed with the aid of the Biostatistics Department of the University of the Free State. We excluded patients with previous abdominal or pelvic surgery, previous peritonitis, previous penetrating abdominal injury and abdominal hernia because of the risk of adhesions increasing the complication rate. Patients were discussed with the radiologist prior to performing the procedure. Patients required an Hb > 8g/dl, with a normal clotting profile (INR <1.4). Patients were kept nil per mouth from 22h00 on the night preceding the procedure. The patients' abdomens were washed with Hibiscrub on the preceding day and the morning of the procedure. Bowel preparation was administered with two doses of Colo-prep the day before the procedure and patients were only allowed fluids orally. They were given Paracetamol 1 g orally two hours prior to the procedure for pain relief, and Vancomycin 1 g and Amikacin 500 mg IV one hour prophylactically prior to the procedure. After confirming suitable blood results, excluding contraindications including allergies, the procedure was explained and the patient asked to empty their bladder before being taken into the fluoroscopy suite. Because the catheter was subcutaneously tunnelled from the infra-umbilical entrance site to the catheter exit site, the exit site was marked prior to starting the procedure. With the patient standing erect, the exit site is just lateral to the midclavicular line and just superior to the patient's belt line (Figure 1). The patient then lay supine on the fluoroscopy table and a screening abdominal ultrasound was done to confirm an empty bladder and to check for any unsuspected intra-abdominal pathology. Patient monitoring was set in place (pulse oximeter, ECG and blood pressure cuff) and intravenous access was obtained. An anaesthetist performed conscious sedation, according to own drug preference. The radiologist and assistant scrubbed up and cleaned the anterior abdominal wall, which was then draped using the standard sterile technique. The catheter insertion site was identified on the midline, just infra-umbilically, and infiltrated with 2% lignocaine without adrenaline (Figure 2). A vertical incision of 2 cm - 3 cm was made at the insertion site with blunt dissection through the subcutaneous tissue up to the rectus sheath. 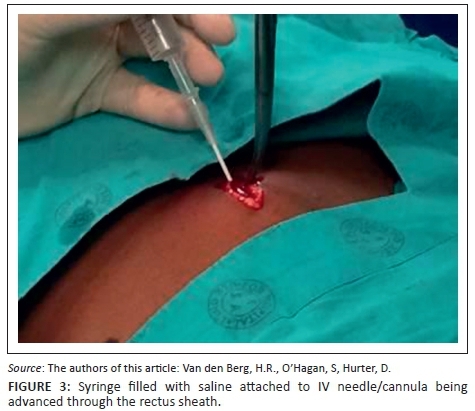 A 20 ml syringe was filled with saline and directly connected to a 16-gauge IV needle/cannula assembly that was slowly advanced inferiorly through the rectus sheath, whilst the rectus sheath was lifted anteriorly using an artery forceps. Gentle pressure was simultaneously applied to the plunger until resistance was lost, confirming the intra-peritoneal position. The cannula was then advanced whilst the syringe and needle were removed (Figure 3). 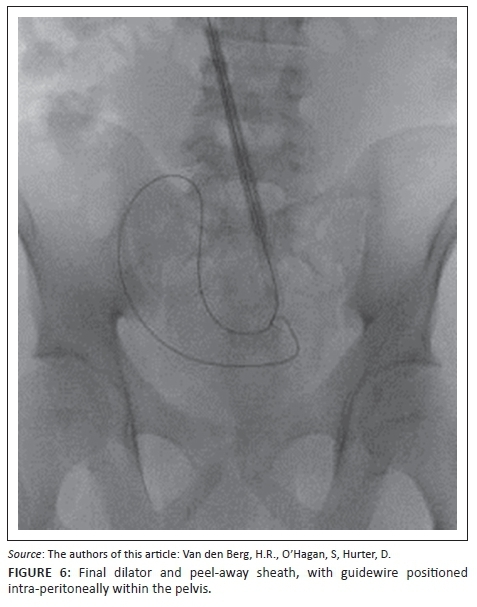 The rigid guidewire supplied with the kit (Medionics International, Ontario, Canada) was advanced through the cannula and directed towards the pelvis under fluoroscopic guidance (Figure 4 and Figure 5). The cannula was removed and the entrance site was sequentially dilated over the guidewire with 10 - 16 F dilators, with the provided peel-away sheath covering the final 18 F dilator. The dilator tip position within the pelvis was confirmed fluoroscopically (Figure 6). The dilator was removed and the 62 cm coiled, double-cuff PD catheter (Medionics International, Ontario, Canada) introduced over the guidewire and through the peel-away sheath into the peritoneal cavity with its coiled tip within the pelvis. The catheter's inner cuff was advanced up to the rectus sheath whilst the peel-away sheath was removed. The position within the pelvis was again confirmed fluoroscopically. 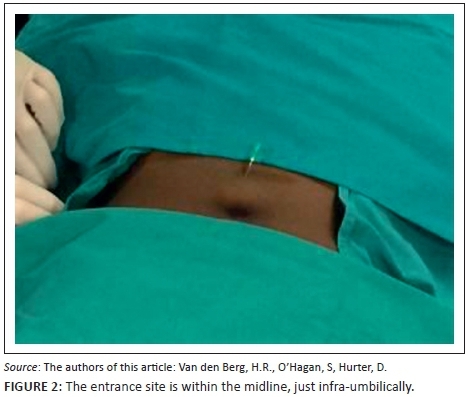 A 0.5 cm vertical incision was then made at the previously marked exit site and the catheter was tunnelled subcutaneously through the exit site, leaving the outer cuff buried within the subcutaneous tissue (Figure 7). It is important not to have any acute turns, twists or tension on the catheter. 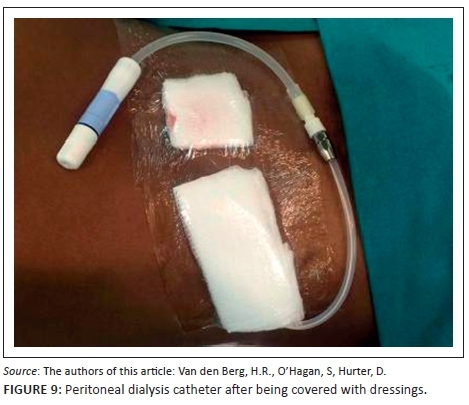 Functionality was tested by infusing 500 ml of PD fluid through the catheter. It should flow freely, without any pericatheter leaks. The fluid was then drained again and monitored for evidence of acute haemorrhage or bowel content. The bag was disconnected and replaced by the locking adaptor (Baxter Healthcare Corporation, Deerfield, USA) (Figure 8). The entrance skin incision was approximated using the interrupted horizontal mattress suturing technique with Nylon 3/0 and covered with a sterile dressing. The catheter exit site was covered with sterile gauze and an Opsite dressing specifically not applied to the catheter (to prevent difficulty in subsequent removal). 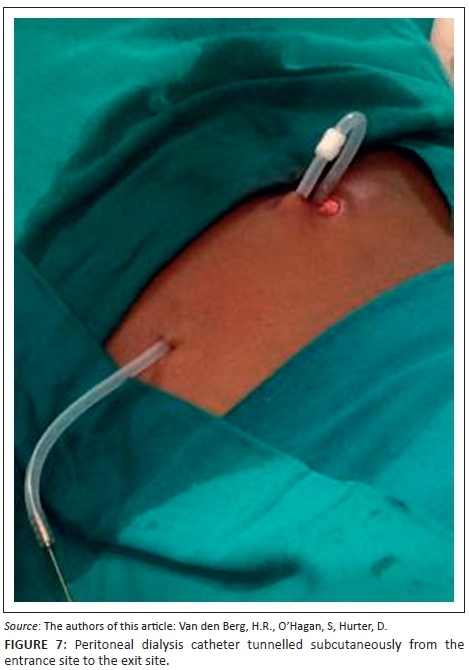 The exit site was not sutured to avoid seroma and potential infection (Figure 9). 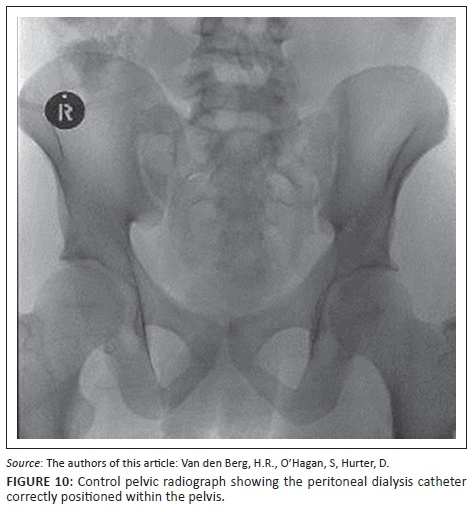 A control pelvic radiograph was taken to document and confirm the correct position of the catheter (Figure 10). Table 1 shows the demographic data and clinical characteristics of the group of 25 patients with 16 men (64%) and nine women (36%). Ages ranged from 18-60 years, with a median of 44 years. Hypertension was the primary cause of ESRD in 10 patients (40%), followed by diabetes mellitus in 5 patients (20%). 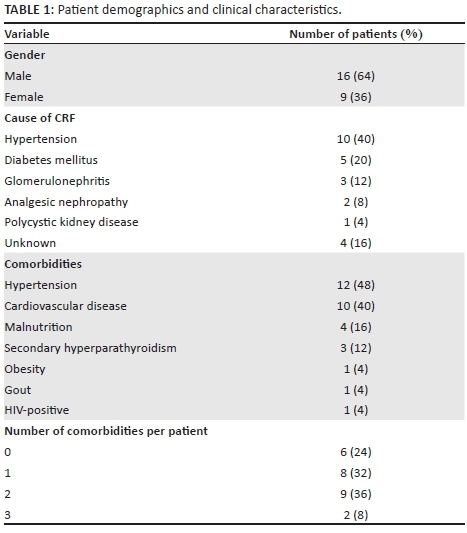 These data appear to be more in line with causes found in the developed world as opposed to literature stating hypertension and glomerular disease as being the main causes of ESRD in Africa.1 Nine patients (36%) had two comorbidities and eight patients (32%) had one comorbidity. Hypertension was present in 12 patients (48%); cardiovascular disease was the next most prevalent comorbidity, found in 10 patients (40%). At our institution, all the patients were started on HD, because they needed urgent acute dialysis owing to their poor clinical condition and were selected for PD, based on patient preference, an acceptable social and psychological evaluation, and absence of contra-indications. Our method of catheter insertion, as well as the open surgical technique under general anaesthesia in theatre by the general surgeon, were available options. There were two classes of reasons for choosing to insert the catheters percutaneously under conscious sedation within the Radiology Department, instead of under general anaesthesia in theatre. In 23 cases, this was because of lack of theatre time and/or unavailability of a surgeon, and in two cases because of the high risk of general anaesthesia. Our study confirms the utility of the percutaneous placement method as an alternative, especially with limited resources. 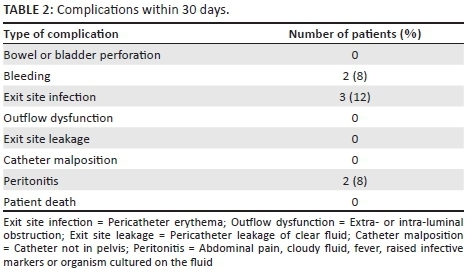 Table 2 shows catheter-related complications encountered within the first 30 days. 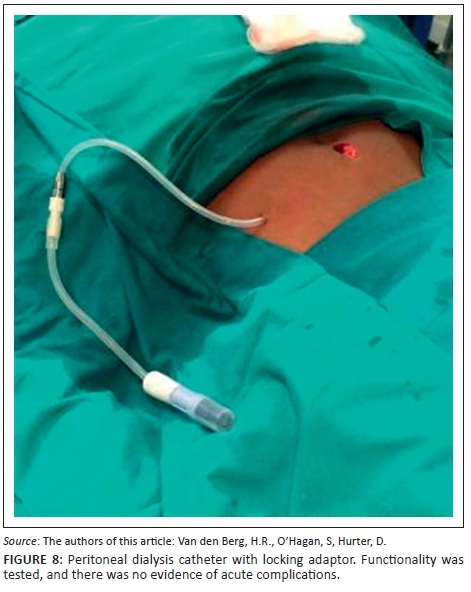 Two patients had minor bleeding at the infra-umbilical entrance site immediately after catheter placement. The bleeding was controlled prior to the patient leaving the fluoroscopy room, one by manual compression and the other by cauterisation. Of the three patients who developed acute exit site infection, one progressed to intractable peritonitis, and his catheter was removed after 10 days. This was also the only HIV-positive patient. A second patient who developed peritonitis was successfully treated with antibiotics. Table 3 shows catheter-related complications encountered between 30 days and one year after catheter placement. One patient's catheter migrated out of the pelvis and was removed after 47 days owing to irremediable outflow dysfunction. Another patient's catheter kinked and was removed after 33 days. 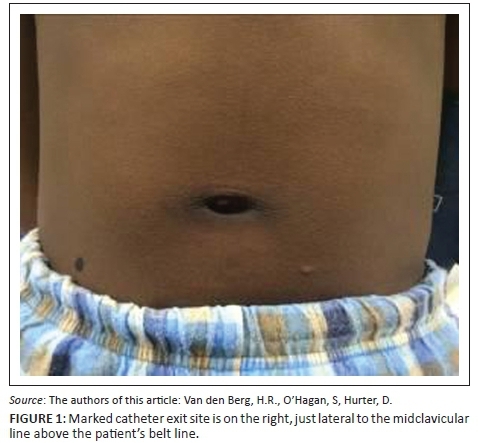 A further patient developed exit site infection and seven patients developed peritonitis. 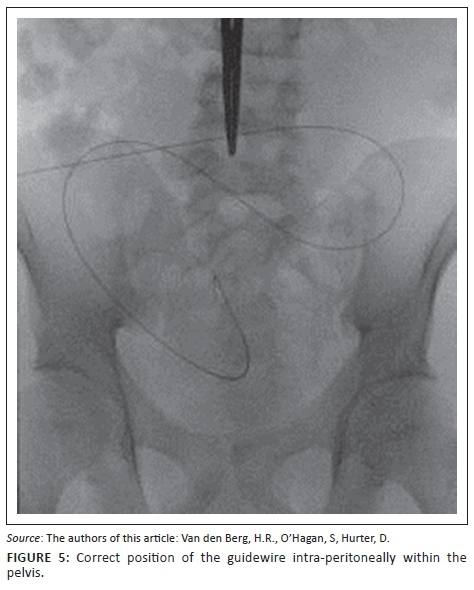 Of these seven, the catheter was removed in only one case owing to intractable peritonitis; the remainder were treated successfully with antibiotics with no recurrent related infections during the one-year follow-up. In total, nine patients developed peritonitis over the one-year follow-up period, which gave us an overall peritonitis rate of 0.75 episodes per patient-year. The 3 patients who died before the one-year follow-up had normally functioning catheters at the time of death. Only four catheters were removed during the one-year follow-up period. Using the Kaplan Meier method, this gave a one-year catheter survival rate of 84%. Our early exit site infection rate of 12% is slightly higher than that found in the literature, which ranges from 0 - 8.2%.9,10,11,12,13,14,15 The increased infection rate might be attributable to the lower socio-economic status of the patient population or the small study group. The overall quoted infection rates vary; our peritonitis rate of 0.75 episodes per patient-year is, however, higher than that recommended by the International Society of Peritoneal Dialysis 2010 update. They recommend aiming for less than 0.67 episodes per patient-year. This difference could be related to our patient's socio-economic circumstances.16 However, of our nine peritonitis cases, all but two patients were successfully treated with antibiotics, and we had no recurrent episodes within the one-year follow-up period. The study was retrospectively performed, with relatively small patient numbers. Certain patients were excluded from the procedure in the preoperative evaluation, but some who were unfit for general anaesthesia were included. There is good evidence that percutaneous placement of PD catheters under conscious sedation has advantages over the open surgical and laparoscopic placement techniques. The procedure is relatively easy and can be performed in any hospital with ultrasound and fluoroscopy facilities. There were no major complications in our series and, except for a slightly elevated infection rate, outcomes were on a par with comparable international data regarding complications and catheter survival. Percutaneous PD catheter placement under conscious sedation with the aid of ultrasound and fluoroscopy is therefore a sound alternative to conventional methods in the resource-limited developing world. H.R.v.d.B. (University of the Free State), was project leader, wrote the study protocol, obtained ethical approval, collected data, analysed the data and wrote the article. S.O'H. (Kimberley Hospital), collected data, reviewed and gave input on the final article. D.H. (Kimberley Hospital), was the supervisor and gave input on the final article.